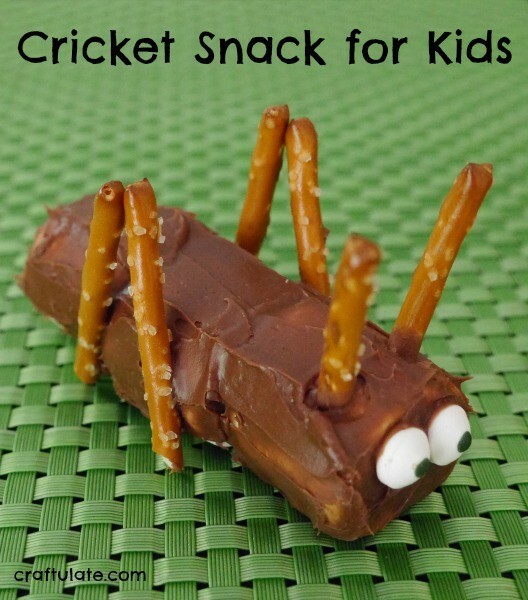 This snack was inspired by the book Quick as a Cricket but it could easily go alongside Eric Carle’s The Very Quiet Cricket too! I haven’t played around with food for a while so I decided to try and make this snack in the shape of a cricket. Thread three marshmallows onto a cocktail stick. Cover in chocolate frosting, smoothing it over with an icing spatula or knife. Break the pretzel rods into pieces – adding two for each leg in an upturned “V” position, and two shorter ones for the antennae. Add two edible candy eyes to complete the cricket! F spotted them immediately in the kitchen and wanted to try one. He wasn’t convinced by the pretzel rods but everything else was approved! NOTE: please remove the cocktail stick before giving this snack to young children. If you love this book as much as we do, then check out the other Book Club Play Date activity ideas from my co-hosts! This is so adorable! I love it so much! This is a cute project! I think I’ll try securing the marshmallows with pretzel sticks instead of the toothpick and see how that works. Thanks! This looks yummy! My boys would just love it! I am definitely gonna try this but with banana and Nutella just to make it a little healthier. Thank you for the idea.